Video panel on p2p lending at Le Web with Samir Desai, CEO of Funding Circle, Renauld Laplanche, CEO of Lending Club and Raffael Johnen, CEO of Auxmoney. Deutsche Bank Research released a new e-banking snapshot focusing on p2p lending. Notable trend is a shift to automated bidding (vs. manual selection of single loans). Interesting results are the findings that loans with longer loan descriptions have a higher default risk (at Lending Club) and that lower cost are not the only motivation for borrowers to use p2p lending services (offers by banks might actually be cheaper). MYC4 is still struggling with the situation of it’s local provider Ebony in Kenia. After some issues raised questions, MYC4 attempted to investigate Ebony’s portfolio. However when MYC4 attempted to perform an announced audit at Ebony’s premises in Nakuru accompanied by 4 auditors of KPMG, they were denied access. MYC4 filed an application in court in order to get access to the files. However on October 30th the court postponed the case until December. Kiva had paused Ebony last year after unsatisfactory results and defaulted all Ebony loans last month. In Germany p2p lending usually received positive to enthusiastic press coverage in the past. Today’s article in Handelsblatt (a financial newspaper) online edition has a more critical tone, pointing at fee structures of one service and wondering why the German Bafin (the regulation authority) sees no need to monitor activities of p2p lending companies more closely. The article does also cite positive recommendations of consumer advocates for Smava. The New York Times picks up the story of an earlier blog post by David Rodman (‘Kiva is not quite what it seems‘) that started a discussion on transparency and marketing messages of Kiva around the question if Kiva lenders are really aware that they do not lend to the entrepreneur pictured but rather to the MFI which may/will use the money to fund other loans. Lendingclub.com currently runs a promotion. The 25,000th investor to register wins 2,500 US$. To be eligible a registration is enough (no purchase/investment necessary). The winner will be announced after Oct. 31st. The Federal Reserve Bank of San Francisco has just published a 19 page working paper by Ian J. Galloway on “Peer-to-Peer Lending and Community Development Finance“. It examines Kiva, Zopa, Prosper, MicroPlace and Lending Club. While online platforms may never replace conventional lending institutions, such as banks, it is important that the community development finance industry be aware of this emerging technology. Moreover, P2P finance platforms will continue to evolve—allowing for third-party issued loan sales, for example—which may fundamentally alter the way credit is allocated in the future. In either case, the potential community development finance implications are too significant to ignore. 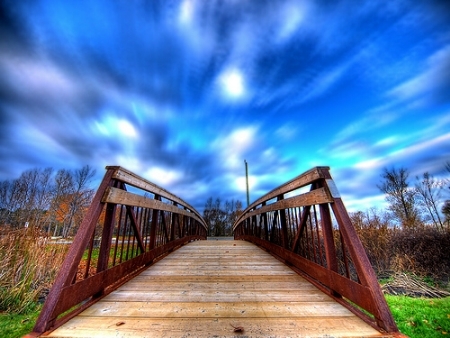 P2P lending services continue to grow. In some markets the speed of growth has even accelerated. P2P-Banking.com has created the following overview table listing services in operation and ranked them by loan volume funded in the past 6 months. For some service like the Korean Moneyauction and Popfunding no figures were available. Also omitted are some services that did not reply to information requests. Note that Prosper.com was closed for most of the observed time span and did not make the minimum cutoff for the table. Also note that Zopa Italy is currently closed. 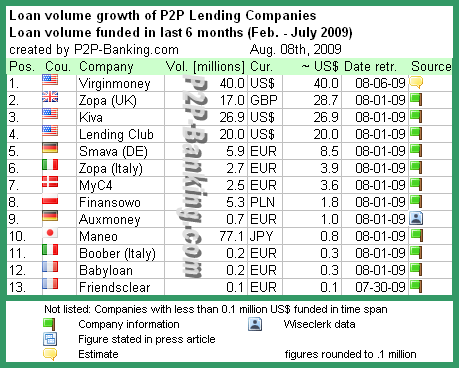 For a table listing more p2p lending companies check previous ‘P2P Lending Companies by Loan Volume – Jan. 09‘. Especially british Zopa and the German services show strong growth lately. Smava nearly doubled loan volume in July compared to June (chart), whereas Auxmoney tripled it (chart). At Smava currently even 25,000 Euro loans (approx. 35,750 US$) are funded with bids in only 4 minutes (!) 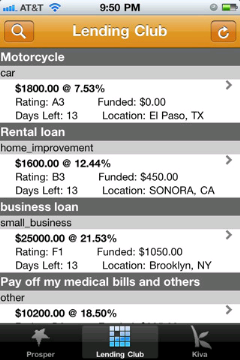 bidding time (example loan). On the other hand MYC4‘s growth slowed in the last months (chart) due to problems with the providers loan picks.